The 20’s centuries’antique, vintage and signed jewelry includes very large part of high quality and innovative jewelry in both artistic and technical field. In order to move in the landscape of the unlimited spectrum of antique jewelry, Blumfields presents on its website the fascinating history of jewelry. From the creations of “art nouveau” with René Lalique and George Fouquet to 1980’s antique and signed jewelry. Lady Blumfields, expert in antique jewelry and well known jewelry’s historian, shows the historical and technical evolution of jewelry and underline the rapid changes occurring in the style and the way to wear these precious objects since the turn of the century. 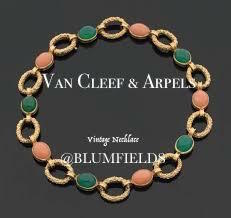 Several times a month, Blumfields, on www.blumfields.com under the heading: «signed antique jewelry “offers you a selection of the 20’s century antique and vintage jewelry from France, Italy, USA and the Japan ... illustrating the major trends. Each antique jewelry illustration gives the importance of the piece and its place in the various times as well as its current value. The choice of antique and vintage jewelry presented by LADY BLUMFIELD relates to craftsmen’s work and real part of creation, and is not made of jewelry only with beautiful stones. Blumfields’ antique jewelry selections are part of the cultural heritage. Antique and vintage jewelry selected by Blumfelds is a contemporary seduction weapon and a "tangible” asset.